Derrius Vick has been the named starter, but don’t consider the Ohio quarterback competition to be over just yet. Frank Solich will start Vick on Thursday night at Idaho, but he says both quarterbacks will play. Vick also entered the season as the starting quarterback in 2014, but his season took a turn when he suffered a leg injury in the home debut against Idaho. Luckily for Vick, he’ll have the chance to redeem himself Thursday in Moscow. 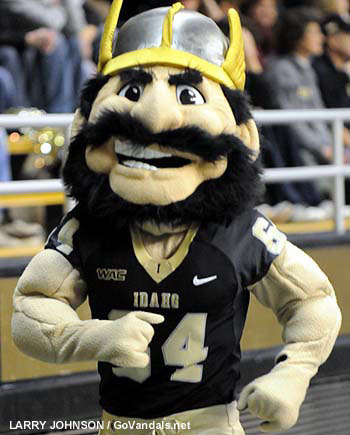 Idaho finished last season with just one win, but the Vandals have optimism for the year ahead. They return many of their weapons, including sophomore QB Matt Linehan. Coach Paul Petrino’s offense can allow for Linehan to air it out 35-50 times per game. Linehan’s top target graduated, but he’ll throw in the direction of Dezmon Epps frequently this season. Epps was Idaho’s leading WR in ’13, but served a season-long suspension after being arrested on a DUI charge in April 2014. Idaho plays indoors at the Kibbie Dome, but current air quality issues in Moscow are of concern to both parties. Solich said his son in Boise was updating him on the conditions, and that the levels of smoke vary from day to day. Solich said he selected Vick over J.D. Sprague because of his consistency, but there were plenty of things considered. Offense: QB Derrius Vick – Derrius got off to a hot start in last year’s matchup with the Vandals. He completed four passes for 68 yards and a touchdown, and also ran for 86 yards before his knee injury. We also didn’t get to see him in the Spring Game. It’ll be interesting to see what Vick has to show in his 2015 debut. Defense: LB Quentin Poling – Maybe Poling knows something about Matt Linehan that we don’t, because he was able intercept the Idaho signal caller three times in last season’s matchup. That game was a coming-out party and Poling built off it to have a tremendous season, leading the team in tackles (89), interceptions (3) and tying Tarell Basham for the team high in sacks (5). He’s only a redshirt sophomore this season, so Poling will have plenty of time to add to his Ohio Football résumé. Offense: RB Elijhaa Penny – The Vandals boast a pass-happy attack, but Penny will get 10-20 carries on Thursday night. Standing at 6’2″,255 lbs., he’s not exactly as easy guy to bring down. We’re talking Jerome Bettis plus three inches, people. Penny reached the end zone on the ground 12 times last season. A bruiser like him should be a good first test for the Ohio front seven. Defense: DL Quinton Bradley – The redshirt senior racked up 6 sacks and 9.5 TFL last season and is arguably the best player on Idaho’s team. His ball pursuit and ability to fill gaps along the defensive is impressive. Bradley will line up against a Ohio offensive line that returns all five starters from last season. Ohio 31, Idaho 20 – The Bobcats are clearly the better team on paper, but Idaho will present some challenges for Ohio. This game should be a very good indication of where the Bobcats’ secondary stands. The Vandals will use the Kibbie Dome crowd to their advantage and get a few points on the board, but I don’t see this one being closer than a ten points in the second half.